Cloud based invoice system! Cloud based invoice system means you can access your invoices from anywhere and will follow you wherever you go. Web Database Client database, billing information, products and services all located from a single location in the cloud. Information is entered once! We also integrate credit card solution right into the invoice if you like. Client clicks and sends them to pay by credit card using PayPal or other merchant accounts. After payment is made client is brought to a thank you page on your website showing your promotions. Imagine before you even get back to the office your client has already paid in full! Website Integration Client fills out your contact form on your website. Name address, phone and email automatically populate client to invoice database. Website design and web Development We do not just make good looking websites. Our website work hard at keeping your business moving forward. To allow our customers take full advantage of our IT expertise, Tactical-Moves offers IT Assessment service. IT Assessment for small business is an evaluation of your company's current technology systems and set up and their relevance to the needs and specifics of your business. The assessment will appraise how the technology helps or hinders the core business, its cost efficiency and potential and recommend how to use technology to meet the business objectives. The assessment can include, but is not limited to, network and systems performance, software audits, strategic evaluations, technical reviews, compliance, risk and data management, web presence evaluation. Secure Login - Your information is secure and allows user accounts. Convert an estimate to an Invoice, to a Receipt in seconds. Convert invoice to a word document, excel file or PDF. Click e-mail or print right from the file. One copy is sent to the client and another sent to your office. Reoccurring payments is easy to set-up. Electronic invoice can be scheduled to send to your clients every month or quarterly. How good is that? Once they pay, it's marked off as paid. 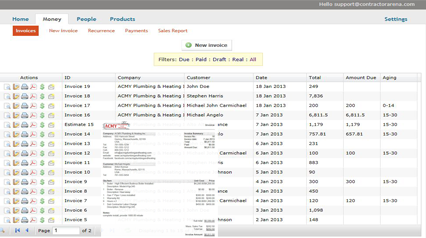 E-Invoice reports - Reports just got easy and maybe a little fun. Know exactly where you stand each day with your estimate and invoices. Easy reporting tool has many option; Year over year, slales tax info, what's been paid, who's not paid. You will know your good paying clients and who's not in seconds. Industry that utilize E-Invoice, web based invoicing; Professional Industry, Self-Storage, Interior Designers and Contractors to name a few. Cut cost and streamline your business today with E-Invoice, electronic invoicing system! Would you like us to learn more? Small business website design and website development solutions incorporate a responsive concept and available web applications. Maximize your ROI with an IT assessment today! Identification of the critical decisions that need to be addressed and available options. Small business network design and deployment solutions offers seamless integration between servers, office desktops to mobile platform to the cloud. Capturing and utilizing data and discover patterns in large data sets and deliver dynamic content. Automate data transfer and Data mining solutions!